Are you on the graduation party circuit this month? The up side of being invited to a lot of parties is that you can eat free every night if you want to. 🙂 The down side is that you may feel obliged to bring a gift to the parties you attend, which can get very expensive (more than you’d spend on dinner, anyway). Keep in mind that you are never obliged to bring a gift. But if you want to, or feel you must, here are some unique graduation gift ideas that are very affordable. While the most traditional gift is cash, you may not want your gift to get lost in the pile. We have a few suggestions for graduation gift ideas that will set your gift apart from the others. More than likely this is the first time the graduate will be living away from home, so what better gift than personalized stationery from Pear Tree? We love the idea of creating a variety pack for the grad. 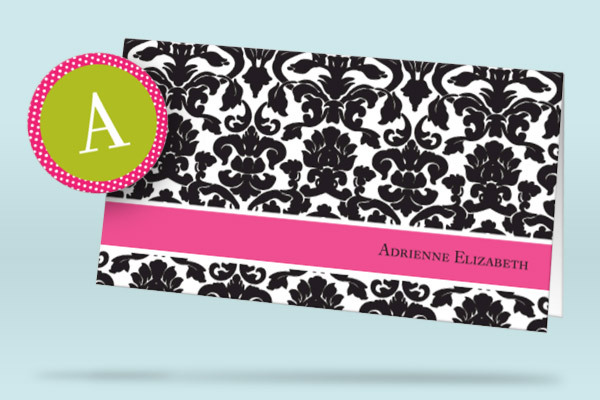 Start with a set of personalized note cards with his or her name on it. You can also personalize note cards with a variety of messages, such as: “miss you” or “thank you” or “happy birthday” on them (just order the minimum quantity of each) to use for other needs. Include matching address labels, stamps, and a nice pen for them to use. If the grad is moving into a dorm room or apartment with other people, personalized stickers with the grad’s name on them make nice labels to stick on the things that belong to them, or to identify their shelf or drawer or storage areas in their new living space. Top off the variety pack with a handwritten note to the grad, and include a fond memory you share or a message of how proud you are of them. Of course mention that you wouldn’t mind hearing from them now and then on the new stationery! An extra nice touch would be to order an extra box for Mom and Dad, so they can stay in touch with their grad. See more graduation gift ideas on our blog. And have fun going to graduation parties!